You want women's sports? I'll give you women's sports. Just last night, I was flipping through the TV channels when I spotted something VERY interesting. In the center of a wrestling ring, surrounded by a cheering crowd, a couple of women with long braids and lovely ankle-length skirts were pummeling the snot out of each other. Turns out, they were two of the fighting cholitas. Apparently, every Sunday in Bolivia, women enter the ring to wrestle in front of throngs of their adoring fans. They stomp, taunt, and dropkick each other--while wearing the traditional multi-layer skirt of the region. Though I suspect it's as "real" as American professional wrestling, you have to admire the ladies' toughness and athleticism. 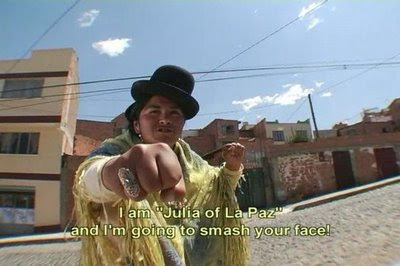 If I ever need a bodyguard (again), I'm definitely heading down to Bolivia. PS: The rump move made my day. Cool! I want to see the documentary when it's done. That is awesome. It does look about as real as American wrestling, but still. has it already come out? They remind me of Verushka. You made my day with that. Where do you get this stuff? that is sooooooo cool!!!! girls are awesome. sometimes i wish i could do that to my little sister!!! Is it choreographed, do you think? It be cool to have mix gender teams. I'd watch that! Hey! Off-topic, I know, but I'm in Sicily for vacation and was wondering if anyone had any suggestions of where to visit. (I'm already planning to go to the Capuchin catacombs- I'm close to Palermo!)Thanks! PS- Watching these women wrestle is so much more fun to watch than big American men beat each other up. I think the skirts make it seem more graceful and fun. Thousands of jumbo flying squid (Dosidicus gigas) or Humboldt squid, were found stranded on southern California beaches over the summer of 2002. The normal range of these squid, also known as Humboldt squid, is from Peru north to Baja California. However, warm water events such as El Niño can extend the range of these squid to Oregon. The first reported stranding was on July 18 at Swami’s Beach in Encinitas, CA, where approximately 200 squid were found over a mile stretch of shore. Their mantle lengths ranged from 16 to 24 inches, and they weighed between 2 and 2.5 pounds. On July 25, several thousand squid beached themselves at La Jolla Shores (pictured above), about 15 miles north of San Diego. Scientiests believe they squid were following prey, possibly grunion, a small fish, and washed ashore alive but were unable to get back into the water and died. City work crews were called to help remove tons of dead fish. I know that we have a mutual interest in squid. I thought this might interest you. Even though its off topic. I's really cool!! If I ever go to Bolivia I have got to see this.